A short week because of Easter and as it had been raining over the break, all of our painted markings had washed away. Dan hired a smaller digger and came back to dig the footings out. The footings are one metre wide and 250mm deep. We then assembled all of the steel reinforcing. It had already been bent by Steel & Tube Reinforcing Ltd but needed tying together. The reinforcing was then placed in each trench on plastic "chairs" to ensure that it remained at the correct height in the finished concrete. 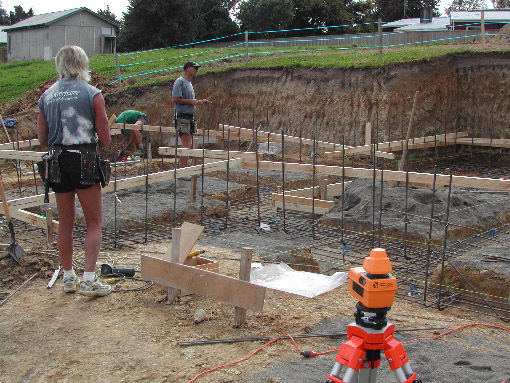 On Thursday we used Kevin Bartlett's concrete pump to pour the footings. It saves lots of manual wheel-barrowing but you have to work really fast as there is concrete flying everywhere! Alan using a laser theodolite to ensure that the levels are correct, Dad ensuring that the steel stays in place, Rob directing the concrete hose, and Fred vibrating the wet cement.